Features adjustable airflow system and quick & easy top fill design, which will make it easy for you to operate. 2.5ml capacity and japanese organic cotton will bring you excellent pure flavor. 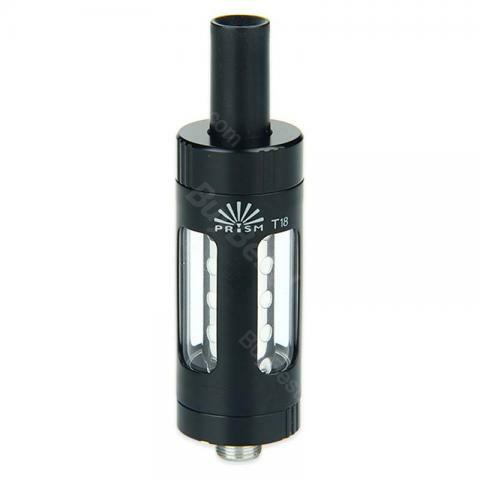 Here comes the Innokin Prism T18 Atomizer. Features adjustable airflow system and quick & easy top fill design, which will make it easy for you to operate. 2.5ml capacity and japanese organic cotton will bring you excellent pure flavor. The 100% stainless steel material will make it stable and reliable. Prism T18 tank comes with a 1.5 ohm pre-built coil and an extra coil as replacement, will be sure to give you amazing vaping experience! • Add e-Liquid against the inside wall of the Tank. Important: After refilling, please wait 5 minutes before vaping. • Hold the Tank with the threading up. • Hold the coil and gently pull to remove. • Carefully and safely dispose of the used coil. Keep away from children and pets. • Ensure that the coil is completely inserted. Caution: Make sure there is no e-liquid in the tank before you pull out the coil. Innokin Prism T18 Tank is what I expected, flavor and vapor is just fine. The coils taste good. Hand over it. Innokin Prism kann man für jeden der umsteigen will empfehlen, für Einsteiger genau das richtige.